My live in bf, his 3 year old son and I went to the shelter(a high kill shelter in Miami--Miami also has BSL) to "look around", never expecting to leave with a dog. My bf's little boy loved her and we did too, so we kept looking around. Since I live in Broward a few miles away from Miami and can have a pit bull and love pit bulls. We went to the restricted area after seeing her, but wrote down her ID, to look for a pit bull. That day there was about 2 and they were full grown and supposedly aggressive, so we couldn't risk taking one because of my bf's son. So we went back to Chloe who we had not even stopped to think might have pit bull. 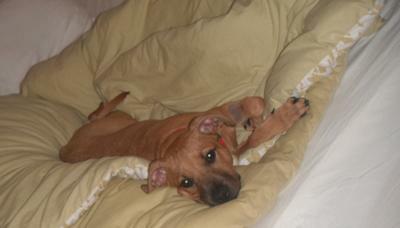 When we got home with her, is when we first said, wait she could very well have pit in her. She was so scared, we would have to drag her outside and within 4 days started showing she was very sick. In her first week with us we spent $1000 in hospital care for her. I don't know how we did it. When the vet told me she might not make it, I cried for 3 days till she was out of the scare. I have only had her for almost 3 months now, but she is part of the fam. She loves to snuggle with us and she sleeps so close to me, sometimes she keeps her face on my shoulder all night...She is by far the most amazing thing that has ever happened to me. Now she is healthy, stands tall when she goes outside and wants to run outside when the door opens. It is amazing how confident, friendly and just perfectly amazing she is!